A couple of months ago, we first heard of a new HTC One X9 smartphone being in the works. The rumors back then pinned it as a high-class handset, with a Snapdragon 820 SoC, a QHD (1440 x 2560) display, 4 GB of RAM, and a 23 MP camera. Later on, however, subsequent reports showed that it's going to be a midranger, with an octa-core MediaTek SoC, 2 GB of RAM, a 13 MP camera, and a 3,000 mAh battery. Full pictures of the device also leaked, showing it in its full glory – capacitive navigational buttons and stereo BoomSound speakers were revealed. Yep, seems we know almost all there is to know about the HTC One X9. There are three things that are still a mystery – price, release date, and regional availability. It is entirely possible that HTC may be prepping the X9 for the Asian markets only, as we've seen it do with spinoffs of its One M9 and One M8 before. Speculations said that the One X9 may be launching in early 2016, possibly alongside HTC's next flagship (One M10?). But a new teaser may be suggesting that HTC is aiming for a launch much sooner. 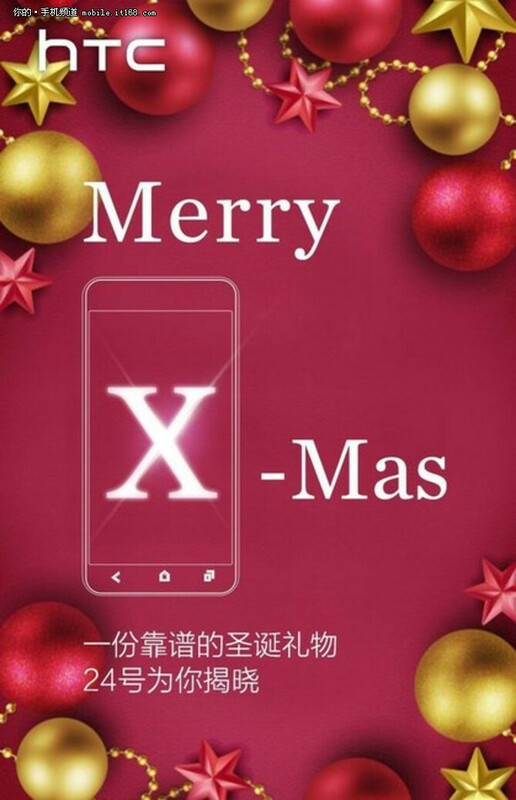 The teaser in question is just a “Merry X-Max” poster by HTC, with the profile of the One X9 being clearly present on the front (the capacitive buttons and the fact that the letter X is right in the center of the device). Could this be a hint that the company plans to unveil the new midranger right in the middle of the holidays? It might be, but it could also just be an effort to draw some attention towards its upcoming devices, while also wishing its fans “Happy holidays”. A smartphone announcement on the day of Christmas? Sonds crazy – what do you think? They got capacitive buttons! Yes! I think, if priced well, its a good midrange device from HTC for quite a long time. Smaller bezels, sleek, symmetric design, metal body, 3000 mah battery, boomsound and camera with ois, probably the same as one A9, which already proved that its good. Seems like a solid device, but dont kill it will ridiculous price. Make it no more than 350 for the base SKU and it'll be a worthy device! what an eyesore, man HTC is really striving to always come back with an uglier device after the m8. Please will someone fire the design team. The design is finally great. Whats wrong with your eyes? simple, symetric with nice speaker grills. It still is a good-looking phone! Not bad in my humble opinion. The design looks like the original butterfly except for the bottom speaker grill. If they really do this on Christmas it better be worth people's time. HTC used to be my favorite manufacturer. Still rooting for them though.